This is the first part of a three-part conversation carried out with the Syrian academic Aziz Al-Azmeh. Here Aziz Al-Azmeh addresses the relation of contemporary political islams and modernities and rejects the notion that they have anything in common with such eighteenth and nineteenth centuries movements as Wahhabism in Arabia, Mahdism in the Sudan, Osman Dan Fodio in Nigeria, etc. Further articles will discuss the relations between political islamisms and women and with the labour movement. The conversations first appeared in iran bulletin in 1997 and 1998. Aziz Al-Azmeh: I have no aversion whatsoever to using the term fundamentalism, except that fundamentalism need not be political, and could be construed as a form of rigorous personal self-discipline and renewed self-fashioning according to ritual and religio-moral requirements. Fundamentalism is an attitude towards time, which it considers of no consequence, and therefore finds no problem with the absurd proposition that the initial conditions, the golden age, can be retrieved: either by going back to the texts without the mediation of traditions considered corrupt (because they represent Time between the present and its putative beginning), as with Luther and Sunni Salafism generally from Abduh through Rida and the Muslim Brothers until now, or by the re-formation of society according to primitivist models seen to be copies of practices in the golden age, as with what are recognised as fundamentalist movements. The latter are known as integrism by Catholics, but the phenomena are similar: moralisation on and in religious terms of private life, authoritarian invigilation and management of society reformed according to institutions that make this possible: Calvinism, the Bavarian (Catholic, naturally) Counter-Roformation, Wahhabism, Khomeinism, are all of this type, in their different ways. Muslim and Protestant fundamentalism are so similar, according to studies by my friend Sadiq al-Azm, that all hesitation against the use of the term fundamentalism for Muslim analogues has no explanation other than sub-orientalist assumptions about Muslim “incommensurability”. So you see, I have no terminological doctrine. AM: Let us turn to a discussion of Islamic movements in a historic perspective. Some analysts argue that the contemporary Islamic system of thought and Islamic political movements have emerged and developed since the middle of the 18th Century through a process of Islamic revivalism. In origin, structures and processes, these movements, appearing throughout this period under the common title “Islamic”, in countries as far apart as Indonesia, Iran, Egypt, and Nigeria, demonstrate great variety. Are there any common characteristics to support the assumption of a direct lineage? Indeed what do you think in general terms about the above approach? AA: I do not agree with this analysis. as it is anachronistic. The movements in the eighteenth and nineteenth centuries: Wahhabism in Arabia, Mahdism in the Sudan, Osman Dan Fodio in Nigeria, etc., have a different character altogether from modern movements – the only comparable movements today are Taliban and the Arab “Afghans” in Algeria and elsewhere. First of all, all these movements have a mujaddidi religious character comparable to that witnessed in the Middle Ages, most particularly in Damascus Hanbalism of the 13th and 14th centuries, exemplified by Ibn Taimiyya, with a primitivist integralism which deliberately steers away from any engagement with modernity and its political and ideological forms and imperatives. Socially they are also distinct, being mostly non-urban movements. But this is not the whole story: with regard to Wahhabism, it was a manner of domesticating Arabian tribesmen under the authority of a trading and patrimonial clan, the house of Saud, by re-socialising them in the context of a new polity formed out of a system of tribal hierarchies, at the apex of which stood the Sauds and their priestly partners, the Al Al-Shaykh, the descendants of Muhammad Ibn ‘Abd al-Wahhab. The emphasis was on so managing the tribes that they acquiesced to payment of zakat, the religious translation of a tax to the state strictly personified in the person of the Imam, later the King. This was an imperative made tangible by shifts in trading patterns in Arabia in the 18-19th centuries. Mahdism was the revolt of slave-trading clans led by a holy family of sufis whose territories were being encroached upon by British expansion and anti-slavery policies – policies whose aims were more than humanistic, being designed to remove the economic bases of their influence. The Sanusiyya movement in Libya was also constructed around the network of Trans-Saharan trade routes which, at the same time as the Mahdists, were being rendered obsolete. Modern movements owe their genesis to other factors. Suffice it to say now that their ideological output is inconceivable without the universally-available equipment of right-wing, para-fascist, populist movements. It is not by accident that they emerged in the 20s and 30s of this century, at the same time as the Indian Hindu fascist RSS, at a time when the West also was very strongly veering towards the extreme right, in a context of anti-Communism no less than of acute crisis in the capitalist system. It is also no accident that, after a period of social, cultural, and political marginalization consonant with developments in the West, they re-emerged in the 80s at a time when, again, the capitalist system is solving its acute crises by resort to creating very substantial locations of economic, spatial, and cultural marginality, in tandem with the revivication of right-wing populist and racist ideologies (today passing under the title of Cultural difference). AM: Focusing now on “modern” Islamic movements, several key issues have been widely discussed, most worthy of further elaboration. Firstly there is the question of the ideology of these movements. As you have suggested, their ideology have not been formed out of a historic development within an isolated pre-capitalist world. Indeed they have been the product of “modern times”, characterised by the global development of capitalism, and its crisis in every dimension, including the ideological. The question is, however, to what extent can the concept of “modern”, in the light of the current discourse of “modernists” and “post-modernists”, provide a sufficient analytical tool for the study of Islamic movements since the 1920s, when these movements remained anti-secular throughout this period? Moreover, considering the fact that the Islamic movements since the 1920s have proceeded through different phases of development, manifested in different ideological outputs ranging from Islamic reformism to Islamic radicalism or political Islamism, to what extent can these variations be explained exclusively by the means of universal trends and not, for instance, the particularity of the Islamic world? AA: I am glad you asked this question. This will give me the opportunity not only to address the affinities, some of them self-consciously elective, between Islamist ideology and fascism, and with the wider expanse of modern anti-modernist ideologies which have informed the ideological repertoire of nativism, right-wing populism, chauvinism, east and west. It will also allow me to address the present location, where post-modernist positions in politics and in the social sciences have their mirror image, not infrequently fully self-conscious, in ideologies of anti-modernism and of historical retrogression. Modernity must first be briefly characterised: it is not a check-list of characteristics that some societies might or might not have, but rather an historical process instituted in institutions and social, cognitive, and ideological regimes of long duration. The Enlightenment itself is not the sum-total of modernity, not least because it was itself multivalent, and not necessarily modernist, although it is modern in the sense that it represents a uniquely modern republic of letters, an intelligentsia outside the control of the Christian priesthood. Modernity, as an instituted historical moment of global reach was located in, and carried by, the new form of state, vaguely Napoleonic, that emerged out of the French revolution: Jacobin in its notions of social engineering and in its legislative and cultural interventionism, vaguely absolutist in its severe centralism which is premised on the relative dissolution of particularism – not necessarily socially or culturally or geographically, but in its conception of the political relation of state to the individual as citizen, ideally without recourse to ascriptive intermediate institutions. Intermediate institutions are here characterised as civic, rather than “primordial”, to use an irritating expression very much in vogue. This state was carried outside France: directly by Napoleon to Italy, Spain, and Poland, by Napoleonic example to Latin America by Simon Bolivar, by institutional example and acculturation to Ottoman lands by the vigorously reformist Ottoman state of the mid-nineteenth century, which accounts for much of what we have in the Arab world and in Turkey today: our histories are still those of the workings of the 19th century and of currents opposed to the modernism I mentioned. And let me add: to modernist transformations do not necessarily correspond state modernist ideologies of the comprehensive kind. The only exceptions are France, Mexico, and the Communist states, although there are strong modernist ideological and, above all, cognitive elements, sectorally present in the ideologies of modernising states. Religion and social backwardness were therefore not often directly engaged by these states, which pushed them into positions of retrenchment and marginality, and precluded serious modernist reform. What modernism there is in modern Sunni Islam in the Arab world is ambiguous, hesitant, apologetic, defensive, and manifestly very vulnerable to attack from both traditionalists and radicals (the two currents presently converged, for instance, in the Azhar, which had hitherto been traditionalist, paying lip-service, under Nasser – who invigorated the institution enormously – to modernism). Let me finally assert that modernism, as I have described it, is by no means an even process; historical movements and trends never are. It is uneven, varying in amplitude and form with time, place, class, and so forth. So the overall global trend is at once combined and uneven. And it was not uniform or fully accomplished, of course, even in Europe itself, where modernity has a history as chequered and uneven as over there where we come from; history knows no consummate conditions. One of the manifestations of this unevenness, East and West, is anti-modernism, which will ultimately take us to Islamism. Beginning in provincial anti-capitalism in the late 18th century (most spectacularly Hamann and his enormous influence and analogues, for instance), and in Aristocratic-conservative and often (but not necessarily) Catholic anti-Jacobinism (de Maistre, Burke), this developed over the course of the 19th century in terms of bourgeois and occasionally royalist movements banding together ideologically against the spectre announced by Marx and Engels in 1848. Conservative ideologies, glorifying Culture, tradition, social instinct, hierarchy, and decrying the deleterious effects of French ideas of progress, historicity, reason, and in certain forms, democracy or even revolution. This was a bloody history, which among other things caused highly authoritarian rulers to legislate for (almost) universal suffrage (Gladstone and Bismarck, for instance). But there was a tremendous ideological armature correlative with this conservatism, and this can be very broadly characterised as Romanticism – intended here not as a sickly or otherwise fiery poetical sensibility, but in the technical sense: this Romanticism gives Culture premium over history, has an organismic and vitalist conception of society in that it conceives societies as individuals by analogy with organic beings, as beings essentially the same, which do not so much change over time as weaken and strengthen, or atrophy and die, and which react to matters culturally imported as a body reacts to the intrusion of a parasite. This Romanticism therefore conceives history as cyclical, and of order – strength and health – as abidance with the conditions of permanence (Culture, Shari‘a, Dharma in India). Political action is therefore one of restoration, and locates assumptions about reason in history in the realm snares of outsiders, for what is of value is social instinct, individual and independent of reason. As for the form of state its takes as the paradigm, it is not only the anti-modernist one based on bringing social instinct and state form into correspondence (hence an Islamic state, or an authentically German Reich, or an ancestrally legitimate French monarchy — or, today with Le Pen, authentically French republic replete with monarchical and Catholic associations and resonances), but also a highly Napoleonic state which, by totalitarian social engineering would coerce society out of its alienation from its past, and re-make it what it once way (incidentally, Sudan has a ministry of social engineering). Now these currents, through the globalization from the nineteenth century of ideological modules of nationality, notions of the People, through novel forms of writing and communication, no less than through new educational systems and the new intelligentsia and state-promoted political discourses, became, along with notions of progress and of democracy, socialism, and others, the staples of public discourse and the necessary correlatives of political and social action world-wide, including the Arab world. Religious discourses were, as I have said , marginalized, but NOT engaged in any systemic or systematic manner. It is not surprising, therefore, that these Islamic anti-modernists should be characterised as modern, and in a sense even modernist in some of their positions. Both Ali Shariati and Sayyid Qutb were great admirers of Alexis Carrel – a famous eugenicist of the 1920s, cultural advisor to the Marechal Petain, who railed against degeneration within, and advocated the cause of a small saviour minority which will bring health to the body of society diseased by degeneration. Now, finally, for the present moment. I have sketched a picture of broad trends and there is no scope to author an impromptu treatise here, except to say that the organismic and Romantic politics of restoration in Arab Islamism was firmly stated by the Sayyid Jamal al-Din Asadabadi, and further specified in shar‘ist terms by Rashid Rida, propagated by the Muslim Brothers, and further amplified by the increasing control over communications no less than educational and ideological agendas by petro-Islamic infrastructures world-wide, supported throughout by the conception of Islam as a bulwark against Communism, or what I would call the cultural tranche of the Truman Doctrine in the Arab World (and of course, in Indonesia and Malaysia in the 1950s and 60s also, a development not unconnected with the renewed patronage of religious education by the Turkish state from the early 1960s; and of course the Pakistan-Afghanistan connection). At the present moment, with the collapse of the post-war Keynesian consensus (Welfarism in the West, developmentalism at our place), a situation is arising in which the conservative ideologies that had been removed from central locations in public discourse in the West no less than in the East are again coming to the fore. The increasing segmentation of the labour market on ethnic and other ascriptive lines is leading to a ghettoization, locally and internationally, in spatial, cultural, and other terms. Hence culturalism, which is fundamentally inspired by the dissolution of civility in favour of community, most potently in the United States, where it was inspired by the highly successful paradigm of the Jewish lobby. This transformation of communalist sentiment into a political ideology cannot be unmediated, and the mediating element is the available module of Romantic notions of society, of group closure, of organism, which until World War II went under the name of race, and today takes the name of culture. In close connection with this are the xenophile and xenophobic adulation of Difference and particularity, with an Islamist mirror-image in notions of specificity, individuality, and authenticity. The objective complicity is also officiated by western NGOs which are today the heirs of the US Peace Corps, as purveyors of culturally-specific aid, virulently anti modernist-state, and as providers of culturalism. This connection is not lost on Islamism: from the use of NGO sympathies and lobbies, under the title of appropriate forms of democracy (connected to Islamism, as our origin and our fate), no less than in the post-modern (but consummately modernist) critiques of Enlightenment notions of progress and of reason. The preposterous notion that the Enlightenment is an imperialist project is closely connected to this: it was not, of course, and European history itself has not been one of Enlightenment but one in which the anti-Enlightenment was profoundly constitutive, and what was consciously exported to us was exploitation and racism, not the Enlightenment: this we had to reproduce ourselves, against tremendous odds, states and societies alike. As for what you refer to as the “particularity of the Islamic world”: I do not think, first of all, that the Islamic world exists in the order of nature, but is something being constructed by both Islamists and Westerners (Huntington is only representative, not an original mind) re-dividing the world ideologically, along culturalist lines, at a time when developmentalism has gone into abeyance, replaced by structural adjustment, cross-conditionalities, and the like. Just as there is a natural theology of the market, there is one of culture, culture deregulated and sundered from the state, the main agency of our modernity in the last century and a half, relegated to communities-individuals. Specific conditions in different Muslim groups provide the symbolic but not the ideological armature of Islamism. If we replace the names of Muhammad and the Shari‘a by Ram and the Dharma, we will arrive at the same ideological tropes as characterise Hindu fundamentalism fascism, and if we substitute for them Christ or Jeanne d’Arc, we will join up with evangelical fundamentalism and French racism. Where particularity also comes in, is in the social networks through which Islamism operates, but this again has global analogues in the vast areas of marginality and structural unemployment I have spoken of. And finally, one should not underestimate the populist and hyper-nationalist functions carried by many fundamentalist groups, including those in Iran . AM: Before moving to another question can I return to the issues of the re-emerging conservative ideologies. Among the various very interesting issues that you raised, and any of which we could usefully expand, I would like us to briefly concentrate on the above. As you pointed out, the socio-economic context may hardly provide a satisfactory explanation for the transformation of spatial or cultural ghettoizations into political ideologies without being mediated with, for instance, module of Romantic notions of society. However, while the concept of “culturalism” infuses significant light on the transformation of communalist sentiments into conservative ideologies, they do not explain how these ideologies transform themselves into popular movements challenging the dominant political structures. Yet, it may be argued that the culturalism paragigm, and particularly its managerial assistant, Western NGO’s, are acting perfectly in favour of community participation and institutionalisation of community movements as elements of cost sharing in the context of structural adjustment. We therefore might need to clarify how a conservative political ideology, such as political Islamism, is able to develop into a political movement seeking state power, with massive support among the most socially and spatially marginalised people, and why this is a conservative ideology and not, for instance a progressive one? AA: I think we should locate the answer as to the reasons for the success of conservative populist ideologies of a pronouncedly sacred character in the moments of their emergence. We have had these throughout this century, largely on the margins of life, as I have already said. There is no great mystery there, for societies and historical masses adjust when they change in various ways, disadvantaged groups (and here I mean cultural disadvantage, not necessarily material disadvantage), residual or moribund social groups, not unnaturally try to perpetuate themselves by the device of Reform: the idea of change from within, which involves transcoding histories, that is, reading the present in the past, including the Koran, and presenting historical experience, and the text of the Koran, as an anticipation of the inevitability of modernity. We have had one Arab Communist proving, without any call for doing so, that the Koran anticipates not only Engels’ Dialectics of Nature, but also the whole science of cybernetics and the idea of reading nature through the medium of mathematics. This is the sort of unnecessary apologetism, a pandering to an imaginary people supposedly only receptive to religious language and symbols – the very People which, as a sociological constituency, sustained Communism, Nasserism, and Ba’athism. We must resist the temptation to propagate the Islamist thesis, used to great propagandistic effect abroad and appealing to moral sentiment in anomic times inside, that a Muslim is by nature Islamist in his political passions. The two are quite separate. Most of the pious people I know repudiate political Islam and hold Islamist politicians in contempt, as persons using religion for profane ends. What accounts for the specific difference of the present moment is the virulence of the amalgam between religion and populist politics. A number of factors can be identified, none of which is in itself sufficiently explanatory, but which cumulatively and in simultaneity produce an elixiric effect. We must – again – resist the temptation, again widely held, to see a “return” to Islam: this is unhistorical, it does not take seriously the profound changes undergone by our societies, and does not account for the “absence” of that which is supposed to be “returning”, quite apart from it assenting to the political Islamist reading of itself: no, no organic or romantic answer can satisfy the critical gaze, and we must move elsewhere for explanations, which need not be total or fully “structural” in the sense of conveying a certain inevitability. We must also be conscious of how untraditional this neo-traditionalism of Islamism is, and how very much out of keeping with social practice it pretends to represent: otherwise it would not have required – wherever it has sought to expand – the deployment of such an extraordinary and continuous amount of violence, in ways small no less than dramatic. It does so because it out of keeping with social life. Looking for explanations as I have suggested, cumulatively effective and separately and collectively intensified by acting simultaneously, leads us crucially to the organisational and infrastructural aspect. This story with regard to the Shii priesthood in Iran is well-known, and needs no repetition. Let us not forget the cultural tranche of the Truman Doctrine. This produced the first elements of building an international infrastructure of educational and information institutions. These accelerated and broadened as the result of Petro-Islamic largesse no less than the presence in the Arabian Peninsula of millions of Arabs and other Muslims subjected, at an early age, to the local education system, whose religious component is generally very obscurantist. All these international infrastructures remained fairly dormant until galvanised into action and momentum by the Rushdie affair. The Islamist effect was not only delivered educationally and morally. It also delivered itself, in Egypt for instance, or in parts of Lebanon which constitute Hizbollah territory, by medical care, social services, subsidies, and the employment of young men otherwise unemployed or unemployable. All this occurs in a situation of spatial and social marginality and segmentation, of which segments are picked off , through educational, cultural, and social services, by political organisations of a quasi-Leninist internal structure, endowed with vast amounts of ready cash, the sources of which are well-known. Much of this creates a moral bond, in milieus which associate disadvantage with the immorality of others and the breakdown of common decencies, erstwhile social bonds, and the spread of general anomie. It is not surprising that the recreation of social bonds in this context, coupled with social exposure to a savage capitalism exacerbated by the withdrawal of the Keynsian prophylaxis I have spoken of, produces not only a moralisation of politics, but a sanctification of morality, which of course hardens it considerable, and renders indecency into irreligion. Moreover, situations of relative desperation are receptive to salvational delusions, to eschatalogical and total suggestions: “the heart of a heartless condition, the opium of the people”. So much for the internal workings: the external, as expressed in political programmes, take the form of expression in the Romantic modules. As for progressive ideologies, these had been subjected to attritions over the past few decades, as part of an historical alternative to capitalism and imperialism, the same attritions that brought down the Soviet block. Hence the idea, erroneous but nevertheless very common, of a “return” – to religion, to fascism, to Slavophilism, etc. All these existed before, no doubt. But there is no return to them, for not only are they renovated and refurbished, but are also, crucially, not fully representative of their histories. Nothing ever is; therefore, no nature which is Muslim or Slavic, only renewed Islamic or Slavophile tendencies which move across the space of society, from the centre to this or that periphery, or vice versa. As for the NGOs, the native sentimentalism of the way in which the well-intentioned ones regard natives leads them generally to recreate imaginary communities under the auspices of their most retrogressive elements. They also work sympathetically with centrifugal forces, with social particularities that, with support and given external desire, can be willing to turn themselves into political particularisms. This is of course highly destructive to the civic national fibre requires, if there were to be any meaningful social, political or economic development. We should not be willing to hail opposition to dominant state structures irrespective of their orientation and probable consequence, or to embrace the demagogic anti-state nihilism very much in vogue – by Islamists outside power, and by NGOs, no less than by forces of neo-globlization, of structural adjustment. Professor Aziz Al-Azmeh was born in Syria. He is currently professor at Central European University and Director of Specialization Religious Studies. 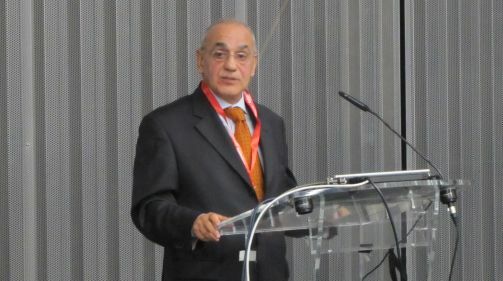 He has been Chairman of the Arab Human Rights Organization (UK branch) and a member of the Standing Committee of the Arab Communities Conference in the UK. His publications include Historical Writing and Historical Knowledge, Arabs and Barbarians, “Heritage” as Power and History, Secularism, Religion and Society in Contemporary Arab Life. (in Arabic); Arabic Thought and Islamic Societies 1986 Croom Helm; Ibn Khaldun: An Essay in reinterpretation, 1990 Routledge; Islams and Modernities 1993 Verso; Muslim Kingship: Power and the Sacred in Muslim, Christian, and Pagan Polities 2000 I. B. Tauris.